This is my third time ordering a mattress from you... it’s always an amazing experience. Great prices, service, and especially product!! I love climbing into this bed and my boyfriend’s back pain has almost entirely disappeared after only a couple weeks. 10/10 thank you so much! 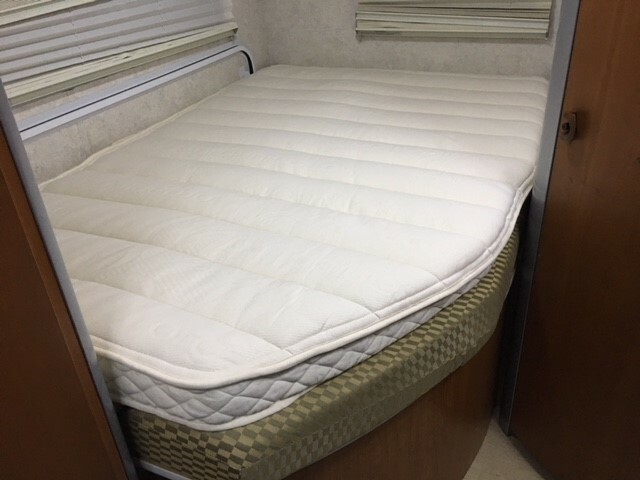 The custom cut Talalay latex mattress and cotton/wool cover look good on spot in our RV. We tried it out last night for a few minutes and it’s as you described “floating on air”. We’re looking forward to finding a place to camp in woods or beach and sleeping in bliss. I walked in not expecting much. I was pleasantly surprised that Robert came over and spent a lot of time with us explaining the different firmness levels as well as a few good things to know about the beds and chemicals and basically answering any questions we could come up with. We found the firmness we liked (5" of 54 firmness foam with a 3" memory foam topper) and he then showed us how to order it off their website (in the store) so that it was a complete mattress which ends up being much cheaper than if you order just those two pieces alone. Also there is a great warranty on the full mattress. When we were done he said the mattress would be ready in a little over a week and we were crestfallen. We've been on an air mattress since the beginning of the month and were getting sore and not sleeping well. He said he could ask for a "rush" on the mattress and that would shave off a few days. So we left (on a Monday) hoping for a completed mattress on Friday. Having read the reviews here, I said to my girlfriend "well, let's see if they actually hit that date cause the Yelp reviews suggest that might not happen". THEY CALLED THE NEXT DAY AND THE MATTRESS WAS READY. I was thrilled. Not only that, they pack the mattress down so frickin' small. My Toyota Echo, 4-door was able to accommodate the queen size mattress bundle. Which is CRAZY. Basically we were on a new bed that night with 45 mins in the store on Monday and 20 mins picking it up on Tuesday. I should also mention that we are very happy with this mattress and are now happily looking at bed frame options. THANK YOU FOAMORDER! Am very happy with your service and product . I plan to order two more mattresses after I have slept on this one for a while. Thank you. Just wanted to let you know that we are very happy with our mattress. You guys were great to deal with. Love your website, especially the descriptions of your products and detailed info. Thanks. Yesterday I went into Foamorder's retail outlet, to place an order. The sales associate was extremely helpful, knowledgeable, and went out of his way to explain what he was doing, helping me come to well-informed decisions, helped to save me money by advising me against purchasing what I don't need ... I felt very well taken-care-of. My experience with Foamorder has always been good. We've purchased two mattresses from them in the past 5 years -- excellent quality, excellent service, and fair pricing. Five stars.